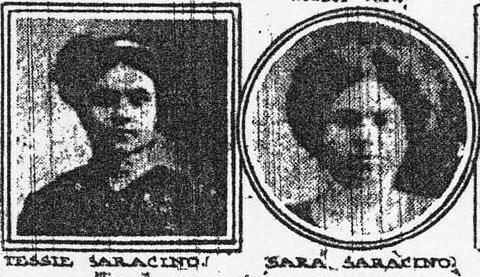 The song is about two sisters, Sarafina and Teresina Saracino, who were killed in the 1911 Triangle Shirtwaist Fire. They were recent Italian immigrants, who came from Italy to New York City along with their parents and brother. When the fire broke out at their workplace, they, along with 144 other mostly women workers, discovered that bosses had locked the doors. Many workers clambered onto the fire escape, but it soon twisted from the heat, dislodged from the building, and tumbled to the sidewalk below. 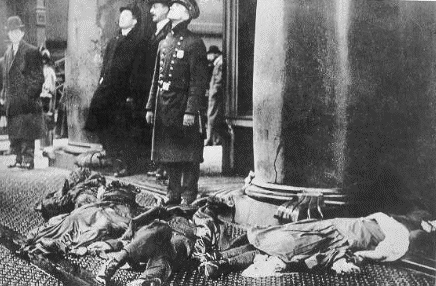 All 24 women who were on the fire escape were killed. Dozens of women were then faced with only two grim possibilities: they could stay inside and die of smoke and flame, or they could leap from the windows to die on the sidewalk below. Sarafina and Teresina are two of the women who chose the second way of dying. Police and other observers watched helplessly as workers plunged to their deaths. In my song, I imagine Sarafina and Teresina as leaping not to their deaths, but as leaping into eternal life. Strong Catholics, the two sisters would have embraced the vision of angels carrying them to Heaven once they leaped out of the window. Sarafina was named for the Great Seraphim, powerful angels who are arranged in the celestial hierarchy closest to God. In the Christian Bible, the Great Seraphim are described as having six fiery wings and eyes that flamed. Among the list of saints in Catholic theology, St. Seraphina is described as a poor Italian girl who died at the age of 15 after having received a vision. Sick and mostly paralyzed due to a succession of childhood diseases, Seraphina made clothes for people even poorer than she was. True to Catholic Italian naming traditions, it seems entirely logical to me that Sarafina Saracina–Teresina’s sister–was named to honor the saint and in awe of the Great Seraphim. In their final moments, did Sarafina and her sister realize the terrible and tragic irony of Sarafina’s name? First, that she was named for a saint who died young. Second, that her saint made clothes for poor people, while Sarafina herself made clothes for middle class people and died doing it. But perhaps the most awful, horrifying irony is that she was named for angels whose very character was fire. Ultimately, however, this song is about faith and hope. The two sisters leapt not into the chasm of death, but into the arms of angels. This entry was posted in Uncategorized and tagged Triangle Shirtwaist Fire; Triangle Fire; Sarafina Saracina; Teresina Saracina; women workers; industrial accident. Bookmark the permalink. Thank you…!! You honor them nicely….very nicely. I met JD in a hostel in Washington and he played me this song… We were a little drunk, but the images stuck with me and prompted me to learn more about the story and music. A lovely tune, and a sad story – thanks!